Biba Guahan! Biba BMS! Roadrunners had a lot of fun under our island sunshine during our annual Mes Chamoru program and activities. Izumizaki Junior High from Japan was also able to join us in the festivities and got to know the Roadrunner Håfa Adai spiriti. Shout out to our event coordinators, Señora Muña, Siñorita Guiao, and Señora Esteves, for putting together a successful event! Kudos to our volunteers and performers for all your contribution! BMS Crowned Lip Dub Champions 2019! Thank you for all the support and votes that our familes and school community have given Roadrunners for this year's Lip Dub Challenge! Ahhh~~ Beep! Beep! IBOGS 4th Annual Leadership Conference "Unity Through Diversity"
Our youth leader representatives for the IBOGS Leadership Conference held at Okkodo High School on Mar. 23, 2019: Momo Certeza, Ben Lactaoen, Joseph Olarte, Keesha Nuguid, Erin Moldez, Gwen Nava, and Luke Sambilay. Kudos to our Olympians during the Special Olympics 2019 held at Okkodo High School on Mar. 16, 2019! BMS wants your votes! Help our school win the BIG BUCK$ from this year's Power 98 Lip Dub Challenge. Click HERE and vote everyday on ALL your devices! Shout out to our Math Counts Mathletes! Awesome job to our Mathletes for placing 3rd Place ISLAND-WIDE during the Match Counts State Competition held on March 9 at the Pacific Star Resort: Gabriel Bansil, Jason Casas, Michael Villeza, and Jillard De Fiesta! Thank you, coaches, for guiding our students to victory! We are so proud of our boys basketball team as they close the season 2nd place overall with all their hard work and dedication! Great job to our coaches, also. Ahh~~ Beep! Beep! Mar. 18 - Dr. Michael Bevacqua for his book "Roque"
"Uniting the World Peace by Peace": Roadrunners bring a hopeful and positive light to our community. Our 9th Annual Peace March brings our community for the a cause close to all our hearts: to see our world in peace and unity, thriving in the celebration of our differences. We would like to extend a heart-felt gratitude to GEB Chairperson Mark Mendiola, Dededo Mayor Melissa Savares, PTO President Gary Kuper, Superintendent Jon Fernandez, Deputy Superintendent Stacey Sahagon, WES Principal Evangeline Iglesias, MUES Principal Beverly San Agustin, Officer Susie Santos, Okkodo High School's The Last Minute Band, and all the volunteers who have shown our school incredible support. Thank you, Ms. Lansang and Mr. De Leon for coordinating this event! Read more about us on the Pacific Daily News. Congrats on your SWEET victory, Lady Roadrunners! Making BMS proud- our Girls Soccer team is the overall winner for Sugar and Spice Islandwide Soccer Festival! Great job, Lady Roadrunners! Mes Chamoru celebrations begin with Sånta Misa ceremony and fiesta! Thank you to Siñorita Guiao for your delicious potroast. Thank you, Señora Muna, Señora Esteves, Señorita Guiao, and your students, for representing us in this event! We're very pleased to announce that our school's tradition of promoting peace in our community still rings true with this year's Peace March, "Uniting the World Peace by Peace". Our school population will be participating in a march for peace, visiting our feeder elementary schools, and finally commencing the event with student performances from the school and outside partners on March 1st. Our schedule will be as follows. Our school is up for its accreditation visit in a couple of weeks, and we are excited to showcase to our visitors the great learning, talents, hard-work, and accomplishments of our Roadrunner students! In the next couple of weeks, please continue to go over the BMS Vision and Mission with your children. Remind them to behave appropriately and maintain the attributes described in our Schoolwide Learner Outcomes. Lastly, support school and home connection by asking your children what they are learning in school. Instill in them the value of life-long learning. Thank you so much your support and partnership with us! BMS Math Counts Team Places 3rd Island-wide! Roadrunners prove that hard work pays during the island-wide Math Counts Competition Series on Feb. 17, 2019 at the Pacific Star Resort. Congrats to our Mathletes! A job well done! Special thanks to Sasaki Sensei, Ms. Tabunda, and Ms. Ross for guiding our students to victory. February Roadrunner Express: Check It Out! Thank you, Team Invincibles, for lending a hand in beautifying our school. Your value for your community is evident and is greatly appreciated! Ahhh~ Beep! Beep! Kudos to Brandon Kapwich and Mackenzie Mathiot for representing BMS at the Isla-Art-Thon! Brandon and MacKenzie's art work has been on display at the University of Guam's Isla Center for the Arts till March 1st. January 31st marked the opening for this year's Isla-Art-Thon exhibit. Their families were in proud attendance. Author Allison Zimmerman finds herself back on her beloved island of Guam and visits Roadrunners to talk about the importance of self-value and self-respect. Through her easy-to-read book, Ms. Zimmerman, helps us make Positive Choices and encourages us to use our voices against sexual harassment. Thank you, Lions Club, for the gift of vision! On February 5, Lions Club International District 204, donated eyeglasses for our students. 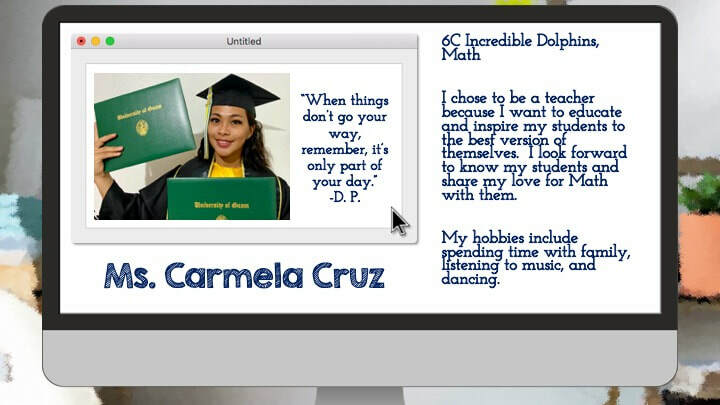 Special thanks to Ms. Shirley Cruz for helping make this possible! Thank you to Ms. Otchengco, and Ms. Unangst for their support! Thank you Mr. Don Lastimoza for encouraging our Roadrunners to Make Positive Decisions and Strive for a Better Tomorrow! Please click here to view Girls Soccer and Boys Basketball game schedules! Team 007 had the opportunity to learn about cyberbullying from Sgt. Tapao from the Guam Police Department. We would also like to thank Officer Santos for helping to make this presentation possible. Roadrunners learned how to keep everyone online safe. Heartfelt gratitude and a bittersweet goodbye to our beloved Ms. Pascua! Thank you, Ms. Pascua, for all that you've done for our Roadrunner family! You have touched many lives with your 40 years of service. We will surely miss you! "Sumptuous" was the winning word! Congratulations to this year's Spelling Bee Champion, Michael Villeza! He will be representing our school in the island-wide SCRIPPS Spelling Bee competition. Way to go, Michael! Roadrunners, thank you for living by your vision of having passion to value your community! This is the 2nd year of BMS raising over 1000 canned goods for the Guam Homeless Coalition's Point-in-Time Count to be held on Jan. 25 this year. Superintendent Jon Fernandez and GDOE PIT Count chairperson Angelina Cruz were able to join in commending Roadrunners for a job well done. Read about us in the Guam Daily Post. Have a great year, Roadrunners! Classes start on Jan. 7 - BLUE DAY! BMS Glee Club Presents "A Million Dreams"
Shout outs to Glee Club and Mr. Quindara for putting together a great production of beautiful harmonies and wonderful memories! Special thanks to DanceVersity, SBA, Mr. Jordan, Mr. Gibson, Mr. Espina, Mr. De Leon, Ms. Brochon, Ms. Erne, Ms. Pineda, Ms. Rodillas, and Ms. Tugade for all your support! Just a friendly reminder to our students and parents that NO BAGS allowed on Dec. 21 and all future activity days. BMS Girls Volleyball A-Team wins this year's championship! Smashing job, Roadrunners! Did you hear the sleigh bells? Thank you for your heart to Value the Community by volunteering for the Sugar Plum Tree gift wrapping at the Bank of Guam! NJHS, thank you for Valuing Our Community! Shout out to NJHS for showing that you care and that you value the community by participating in the Salvation Army's annual Christmas bell ringing. Way to go, Roadrunners! Please take note of the changes to the BMS Calendar that was previously emailed, and kindly plan accordingly. Please disregard all previous versions of the BMS calendar. Make-up days have been accounted for. Please take note that MLK, Jr. Day is January 21 and not January 14 as indicated on the previous BMS calendar. In 2019, classes will resume on January 7 with a blue day, and then ending on May 24 with a gold day. BMS is commited to our Schoolwide Learner Outcomes of Behaving Appropriately and Making Positive Choices. Seeing our discipline data shows us how we need to improve and to commit to a set of actions in order for us to reach our goals. We want to thank our teachers and staff in guiding our students to become people of excellent character, who are prepared for the future. Roadrunners, let's keep on working towards a better future and improved behavior! We can do it! November Roadrunner Express is out! Download here! Click on the image to download the entire newsletter. BMS Roadrunners got in the spirit Nov. 26-Nov. 30 for the following themes: Monday Twin Day, Tuesday Career Day, Wednesday Meme/Vine Day, Thursday Gender-Bender Day, and Friday Autumn Colors Day. Biba Lady Roadrunners on your Volleyball wins! Thank you to the Catholic Social Services, Sanctuary, Inc., and CPS for informative presentations on the organizations that our annual canned food drive will benefit. Calling on Roadrunners to Value Their Community! A huge thanks to Mr. C'zer Medina for bringing Marko Germar (from the TV show "So You Think You Can Dance") and Lauren Santos for inspiring our Roadrunners to Strive for a Better Tomorrow and to reach for their dreams! Please Support Our Community Partner, Island Girl Power! Thank you to Mr. Peter Cruz for teaching our students to Make Positive Choices and stay tobacco-free! BMS' First Global Cardboard Challenge! Congratulations to the following students! Great job, Roadrunners! Please take the surveys below. Wizards and athletes ruled the halls of Benavente Middle School this Halloween. Candy skulls, cookies and cream, and hippies also appeared here and there. Be safe, Roadrunners! Parent-Teacher Conference: Thank You, Parents/Guardians, for Your Partnership with Us! Roadrunners got the chance to participate in Guam Humanities Taking Root Conference, where they learned about present and future ways that we can preserve our island environment. Thank you to Guam Humanities for making us part of this awesome project! Kudos to former Roadrunners Jaedy’ohn Adriano (now JFK HS) and Charesihda Fred for sharing your knowledge and making us feel proud! October is Principal's Appreciation Month! Thank you, Mr. Egrubay, for all that you do to keep our school safe! Oct. 26 (Fri) School Spirit Shirt Day - Students will wear sports, club, or team shirts. Thank you to the Guam Contractors Association for opening up the experience of learning construction skills with our Roadrunners. We learned a lot and we had fun! Congrats Team Roadrunners for taking the bronze this season for Cross Country! Extra kudos to Jonavin Cruz (7th Grade) for placing 6th and Evan Duenas (8th Grade) for placing 10th overall! Ahhh~ Beep! Beep! 10.18.2018 BMS participated in the island's largest earthquake drill! At 10:18am, Roadrunners got to "Drop, Cover, and Hold," getting prepared for any earthquake that may come. ​Club Fair SY2018-2019 a success! Hot off the presses! Read all about it! Check out the many fun clubs and activities that we have for this schoolyear during next week's Club Fair! Students will be escorted by their AAP teachers (BMS will follow Half-Day Early Release schedule). Picture Days will be on Oct. 8 to Oct. 11. Packets will be distributed by Science teachers. Thank you, Mr. Jimmy Munoz, for 33 years of service! Dates: Sep. 28, Oct. 12, Oct. 26, Nov. 30, Dec. 14 and Jan. 18​. Gates will be closed at 4:20pm for the cross country meet. If you happen to get trapped on campus tomorrow Friday (09/21), then stuck around to support our Roadrunners in their race against the rest of the middle schools! Valiant effort from BMS against the reigning champs from UMS but victory wasn't going to happen this time. But Roadrunners are not worried! Practice and strategy is teaching us to be stronger! Great job, Roadrunners! The new school calendar includes Half-Day Early Release (in pink). The bell schedule will be announced for these days (soon to follow). Please discard any copies of the old school calendar. Click on the image to download pdf file. 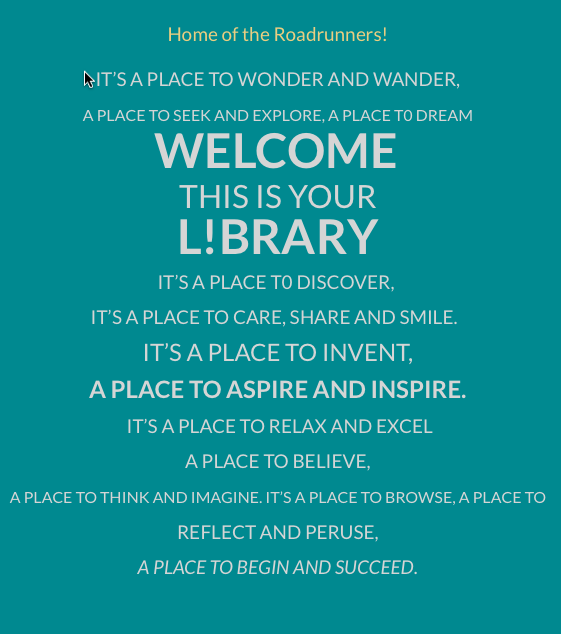 Welcome to SY2018-2019, Roadrunners! Ahhh~ Beep! Beep! Smiles from our helpful faculty and staff put first-day-of-school-jitters at ease. Have an AMAZING schoolyear, Roadrunners! Open up your minds in making positive choices, in making a difference, and in making this one memorable schoolyear! Check out the slides below for useful information shared during the New Student Orientation on Aug. 6. Have a fun and safe summer, Roadrunners! Farewell to our SY2017-2018 8th graders! "A teacher takes a hand, opens the mind, touches the heart, and shapes a future." Thank you, teachers, for all that you are, the way you've touched our lives, and the difference that you've made in every child. Much appreciation for you and all that you do! BMS Robotics take 3rd Place in First Lego League Championship! It's a great year for BMS in leading and winning many competitions! Congrats, Robotics team! You've done us proud again! Thank you to coaches Mr. Lazaga, Ms. Pineda, and Mr. Guiking for your guidance and dedication! Ahhh~~ Beep! Beep! BMS DanceVersity showed that they got the moves! Congrats, team, for a job well done and taking four trophies at the Allied Dance Force competition! Kudos also to Mr. Jordan, Ms. Otchengco, Ms. Guiao, and Mr. Natuel for being great coaches! Thank you Mr. Kuper and Ms. Fernando! Thank you PTO President, Mr. Gary Kuper, and PTO Vice-President, Ms. Rosann Fernando, for donating chess sets and tether balls to our school for our students! You're making our campus a more positive environment. We're truly blessed to have you! Buenas yan Håfa Adai Parents/Guardians! Parent letters have also been sent out with more details on DWA. We will be following the schedule below. Thank you for your partnership! Ahhh~ Beep! Beep! Thank you for coming out and showing support! There are great things happening at BMS: students got talent, PTO is supportive, and faculty and staff are passionate about being a Roadrunner! Kudos to Mrs. Reyes for spearheading this year's event! We're proud to be Roadrunners! Easter Break starts next week March 26-30 (Monday to Friday). ​Have a safe and restful break! Classes resume on April 2 and it'll be a GOLD DAY. Awesome job to our athletes during last Saturday's Special Olympics! We are very proud of you! Thank you to all faculty and staff who showed support. Kudos to Ms. Arlene Pestanas and Ms. Neri Cruz for organizing the event and kudos to Ms. Dorris Abagatnan and Ms. Kellie Castaneto for coaching our athletes towards their success! No doubt about it! BMS is the best in Boys Basketball. Congrats, A and B Teams! Boys Basketball season has come to a close with BMS coming in on top! Great job, boys, for your hard work and dedication! Thanks so much to our awesome coaches for leading our teams to their wins, Coach Erwin Villa (A-Team) and Coach Shawn Bulala (B-Team)! Get into the spirit and learn CHamoru language and culture by participating in one of these events! It was exciting to see the amount of artistic talent and creativity BMS classes have during this year's Peace March Door Decorating Contest! Congratulations to Ms. Sanchez's Intervention class for an outstanding job! Kudos to everyone that participated! You didn't make it any easier again for our judges this year. "#PEACE- Let's Make It Happen!" This year, we celebrated our 8th Annual Peace March, "#PEACE- Let's Make It Happen! ", embracing our school's cultural diversity in order to make peace happen! Roadrunners envision that we can make peace happen through the appreciation and respect of our differences, because of what we share in common- our humanity, our community, and being a Roadrunner. Special thanks to Guam Education Board Chairman Mark Mendiola, Vice-Chair Maria Gutierrez, Superintendent Jon Fernandez, and Mayor Melissa Savarez for sharing this cause with us. Our gratitude also goes out to the US Navy Recruiting Station, Dededo Mayor's Office staff, and BMS PTO President Gary Kuper and BMS PTO Officers. There's so much to tell. Please check out our story at the Pacific Daily News and KUAM. Our girls had a splendid time baking with Ms. Lacno during Island Girl Power's after school program at BMS. If you want to be part of the fun, come every Tuesdays from 3:30-5:30 in Rm. 47! Hope to see there! Great job, BMS Math Counts team! It's a proud time for BMS Math Counts! Congrats to our following Mathletes: Jan Malig-on, Jillard De Fiesta, Jason Casas, Viguel Co, Christian Legaspi, Gabriel Bansil, Clifford Ecal, Juliana Naval, Alvin Nugue, Abigail Gimmen, Ben Lactaoen, Bianca Borja, Ronald Ilagas, and Terence Sarmiento. On March 10, Jason, Jan, Viguel, and Jillard will be competing on the next round of the series at the Pacific Star Resort and Spa. Thank you, FSM Consulate General's office for sharing on the importance of cultural diversity! Thank you, Mr. W-Three Williander and Mr. Johnny M. Silbanuz, from the the FSM General Consulate for touching base with our students on the importance of promoting peace by embracing cultural diversity. Their message ties in with this year's Peace March theme: "#Peace- Let's Make It Happen!" Good luck, Jan Malig-on! You make BMS proud! Jan will be representing BMS at the annual island-wide SCRIPPS Spelling Bee on March 3. Great job, Roadrunner! Gearing up for the 8th Annual Peace March! 1,555 canned goods will benefit the Guam Homeless Coalition's efforts during the Point-in-Time Count. Here, Ms. Torrado's Homebase students, this year's winning class that raised the most canned goods, is photographed with Mr. Egrubay, Mr. Dela Cruz, Mr. Camacho, Ms. Cuenco, and reps from West Care Pacific Island. Thank you, Roadrunners, for your GENEROUS contribution! Happy 2018, Roadrunners! Let this be the year of making positive choices, succeeding academically, and striving for a better tomorrow! Keep yourself updated with upcoming events on the side bar on your left so that you can plan the rest of your schoolyear well! Thank you to The Guam Daily Post for their donation of halogen lightbulbs that will literally light up the walkways and make our school brighter for our students! Lady Roadrunners: a job well done for our Girls Volleyball with win against AMS! BMS win against AMS on Wednesday, Dec. 20, completes the Girls Volleyball season and ends it well. Great job, girls! Ahhh~ Beep! Beep! Roadrunners DO VALUE OUR COMMUNITY! And in a collective effort, collected over 1,500 canned goods to help others in need! To celebrate this success, Dec. 21 is a Dress Down Day. Winning teams- Incredible Dolphins, Black Cobras, and Silver Wolves- will have an additional dress down day on Jan. 12. Congratulations to Ms. Torrado's AAP students for raising the most donations of 151 canned goods! Lastly, thanks to Dr. Margaret Hattori and Mr. Patrick Camacho for educating our Roadrunners about the Guam Homeless Coalition, to whom we will donate our canned goods. ​Lots to be proud of, Roadrunners! Ahhh~ Beep! Beep! Thank you to our very proactive PTO in getting the word out for safer facilities at our school. If you have any concerns regarding the betterment of our school, connect with them through their Facebook page, VSABMSPTO. Guam Visitors Bureau representatives Josh Tyquiengco and Nico Fujikawa make a Tourism Works presentation to 8A Silver Wolves at their monthly assembly. BMS' first ever "The Voice"
Are you Team Cortez, Team Somera, or Team Guiking? Island Warriors got to host the first ever BMS "The Voice" on Nov. 21. But whatever team they chose, Roadrunners proved that they got talent! Great job, Girls Volleyball A Team on your win against JRMS! It's that time of the year again where we, Roadrunners, can show that we Value Our Community! Let's participate in this year's Canned Food Drive! See your AAP/HB teacher for more details. Job well done, Boys Cross Country Team! Congratulations to BMS Boys Cross Country for placing 3rd overall! Congratulations to Jaeden Umagat for placing 5th place! We cordially invite you to SY2017-2018's first Parent-Teacher Conference. Get your child's report card and meet our awesome teachers. Please proceed to your child's teachers' designated rooms. Job well done! to all the Intervention classes that joined this year's door decorating contest, showing up with amazing creativity! Which one is your favorite? 10.24.2017 "Don't Let Drugs Turn You" - Wear your uniform inside out! 10.26.2017 "Sock It Drugs Day" - Wear the craziest socks you can find! 10.27.2017 "School Spirit Shirt Day" - It's all about SCHOOL PRIDE! Wear your sports shirt or team shirt. *Students are to still adhere to the uniform policy and dress code. Spirit Week is not dress down day. A BIG thanks to the National Guard Counterdrug Program and Guam Customs and Quarantines's K-9 Unit for educating Roadrunners about being drug-free and living a healthier lifestyle! Choosing to be drug-free is possible, benefits everyone, and protects our futures for success. Also, shoutouts to STARS Club's rendition of Jason Mraz's "I'm Yours", "I'm More", and DanceVersity! Wear an orange accessory. It can be your socks, a hair tie, a ribbon on your shirt, or a bracelet on your wrist. Show the world that bullying is not the answer and we are united against it! ​*Reminder to students: this is NOT a dress down day but you are encouraged to wear an accessory. Please adhere to uniform policy and dress code. You can refer to the student handbook (access on the right-hand column) if you have any questions. Håfa Adai, Japanese School of Guam! We were able to show life as a Roadrunner through the student exchange with the Japanese School of Guam last week Oct. 17. Thanks to Ms. Cortez for making the event happen. Life as a Roadrunner is a truly busy one, but it's lots of fun! BMS got spirit celebrating our 8th graders this school year. The Guam Allied Dance Force, a Non- Profit Dance Organization, that consists of our DOE Dance Teams & Clubs will be performing at the Micronesia Mall this Sunday, October 15 @ 1:30 pm to promote our non profit dance organization and bring awareness to the community about our dance advocacy! Different middle and high schools Dance Teams & Clubs such as SSHS, OHS, JFK, THS, FBLG, UMS, BMS, & AMS will be there to perform & will have an interactive display and registration booth for interested schools to support our good cause! Thanks to Ms. Raeleen Pangelinan, Ms. Georgia Suldan, and Ms. Janece Santiago from Inafamaolek for training our Roadrunners on peer mediation. A big shout out to our Roadrunners for their talent, support, and especially their desire to value their community. Awesome job to Ms. Neri Cruz, Mr. Elvin De Leon, Mr. Erjohn Guiking, Ms. Jonah Guiking, Mr. Ray Gibson, Ms. Victoria Guiao, Ms. Rita Cortez, Ms. Gen Rodillas, and all the students- Ayesha Mafnas, Marin Cruz, Jerae Gaag, Ivan Aguilar, Ann Tilimwar, Ursiann Kaiser, Tanya Ununo, Jovian Salvador, Achina Aruchy, Miros Koto, Jemerina Santier, Joyce Tither, Terryann Engichy, Jerleen Joseph, Genevie Eliser, Aubrey Castillo, Rio Lubang, Ataray Setik, Starvin Grahm, Ryan Narruhn, Clayton Esuek, and Elpizo Orichiro- who proved that BMS has talent- all for a great cause! BMS was able to raise $518.50 for the Salvation Army's hurricane relief efforts in Florida and Puerto Rico. *Special thanks to SBA and STARS Club for making this event a great success! Gates will be blocked by 4:15pm. Race starts at 4:30pm. Teachers are advised to leave campus before 4:15, wait until between races, or wait until the last race has finished. Help bring awareness by participating in these events. Håfa Adai Parents and Guardians! We invite you to meet your child's teachers during this year's Open House! Welcome to school year 2017-2018! We hope that you have a memorable school year as you develop to become a model Roadrunner! Have a great year! Ahh~~ Beep! Beep! Thank you to our parents and guardians for being in partnership with us for their children's education. Thank you to NJHS for helping with the orientation. And last but not least, a big thank you to our staff for an AWESOME job in getting our facilities ready in time for our students and parents to see! For more information, call 632-5647 during office hours. It wasn't just fun in the sun. Teams played basketball, volleyball, soccer, tug-of-war, softball and flag football with their eyes on the prize- bragging rights. The 3 day event wrapped up each day with the highly-anticipated grade-level team cheer- showing off spirit and pride. Kudos to all teams for practicing great sportsmanship and admirable spirit! Kudos to G-Force for always making Field Days something the entire school looks forward to! Thank you to our Island Girl Power advisors and coordinators for launching this partnership between BMS and IGP: Ms. Juanita Blaz (IGP Director), Ms. Myracle Mogul (Media Detective), Ms. Eileen Mangerero (Positive Action), Ms. Doreen Mendiola (Positive Action), Mr. Ron Espina (BMS advisor), and Ms. Ruth Cuenco (BMS advisor). And kudos to our BMS girls who have become part of the IGP family: Abigail Umagat, Alythea Arce, Ashley Pineda, Jayzelyn Molinos, Aeryn Griffin, Alessandra Pagdilao, Maya Andres, Chloe Quintanilla, Jessalyn Dittrich, Katelyn Thompson, Tess Moon, Emily L. Amaguin, Juliana C. Naval, Jasmine Iriarte, Tatijana Dittrich, and Annabel Francisco! If you can read this- Thank a Teacher! RoboRunners representing Guam in San Diego for the First Lego League Open Invitational Championship! BMS students are on a roll with garnering recent accolades, and now going into a national level! We are so proud of our very own Rizaldy Tugade, Carissa Lazaga, Carl Del Rosario, Robbi Natividad, and Adrian Tambora who will be representing the Guam Department of Education in the First Lego League Open Invitational Championship in Legoland in San Diego, California. They will be joined by coaches Mr. Frank Lazaga and Ms. Louise Togawa. Our Roadrunner family would like to extend special thanks to Dr. Leahbeth Nahalowaa and the Guam Department of Education for making this possible. Read about our RoboRunners at The Guam Daily Post. Let's hear the applause for our very own DanceVersity taking first place for small group division during Saturday's Island-Wide High School and Middle School Dance Competition! This is BMS' first time participating in the event. DanceVersity members: Divine Sakaziro, Gezyrelle Torres, Lyka Sapungan, Reyelle Aflague, Tasi'Ani Deliguin, Nicole Bolus, Georgegina Sapanza, Kristine Escudero, Marilyn Nguyen, Anjelica Magtoto, Vaneza Supnet, Glorin Shaina Socrates, Gabriel Salomes, and Lizelle Prado. Kudos to Mr. Jun Jordan and Ms. Camille Otchengco as DanceVersity advisors! Way to make us proud, Roadrunners! Read more of their story at The Guam Daily Post. Special note for all parents and family members of children 14 years of age and older: DVR will be conducting an orientation and scheduling appointments at the conference. This will start the process for the child's eligibility for DVR and the child's transition process. Parents must be able to commit to the full day. Registrations must be completed to receive a ticket. Deadline to submit registration and reserve your ticket is Tuesday, April 25, 2017. Seats are limited, so please do not wait. Please, click on the links for the flyer and registration form. For more information, please contact 685-7371 or email peptrainingworks@gmail.com. Please, request reasonable accommodations at least three days in advance. BMS joins Dance Competition for the first time! Come out, watch, and support BMS Dance Club this coming Saturday for the Allied Dance Force Island-wide High School and Middle School Dance Team Competition and Showcase! This is the very first time that BMS is joining this competition. Let's give our fellow Roadrunners our full support and cheer them on! Ahhh~ Beep! Beep! A big thanks to Ms. Julie Reyes for coordinating our annual BMS Day at the Mall. Kudos to all students and teachers who performed and set up displays! Thanks to all who came out to support! See Roadrunners showcase talent and pride this Saturday! Time to learn Power Words to help our Roadrunners succeed with the annual ACT/Aspire tests. BMS had a full day of activities this year's Mes Chamoru. From Mr. Egrubay volunteering for the dunking booth, snack sales, chant and dance performances, and pie contests- there was a lot to do for the activity Thanks to Siñorita Guaio for spearheading this event and to all who gave their time and energy to make this event a great success! Biba Roadrunners! Biba Guahan! It was a great time again for this year's 27th annual Youth for Youth Conference. The theme was "Catalyst"- being a force for change. Great job, Charles Cruz and Robert Cruz, for representing BMS well! It's always fun during assemblies at BMS. There are amazing student performances. Just as important, SBA facilitates and gets their peers thinking about the school's discipline data and how as a student body can we improve on behavior. Last month's lesson plan was about distinguishing respect vs. defiance as an intervention for February's data. To make the lesson even more memorable, Mr. Egrubay gave an award-winning performance about these positive and negative behaviors. Great job on really embracing your role, Mr. Egrubay! Ahhh! Beep! Beep! Kudos to Black Cobras for hosting our last student exchange of the school year with students from Izumisaki Junior High. BMS students got to know a little more about the culture and background of our visitors from the Fukushima prefecture. After the introductions, students got to participate in art exchanges such as painting, calligraphy, origami, weaving, dances, and coconut candy making. We hope to see them again! Come out and show some BMS pride and support! Students must still be in full school uniform. No dress down but students are encouraged to have accessories that match the themes. For Chamorro Hat Day (3/31) If students are wearing hat brands from Guam like Crowns, Kottura, ENE WEAR, they are only allowed to wear hats with appropriate Chamoru Sayings/Guam Seal/CNMI Seal. Congratulations to the following Roadrunners for their achievement for Achieve3000. The celebration was held at St. Paul's Christian School on March 21st. Thank you to all who came out to give their support during this year's Special Olympics at Okkodo High School on March 18. Congratulations to Shawn Riate, Cameron Nauta, and Frank Solomon for repping and bringing in the medals for our school! You've made BMS proud! Thank you Ms. Lina Rojas for all that you've done for Benavente Middle School! Your BMS family will miss you! BMS had the honor of welcoming back one its own, Ms. Regine Tugade- Guam Olympian and now a student at the Naval Academy in Maryland. She gave a very meaningful pep-talk to our girls about having goals and dreams, making the right choices, and how to handle issues dealing with middle school. We thank her for taking the time to give back and inspiring our girls! Be a part of a team with Integrity, Service before self, and Excellence in everything they do with JFK's Air force JROTC. Do great things and discover your potential! BMS is in for a treat with guest speakers of various expertise of the Chamorro culture, language, and geography during this year's Mes Chamoru. See the slideshow below for a glimpse of what this is all about and stay tuned for more photos. BMS is now in partnership with Island Girl Power! This partnership offers an after school program to give young girls the option for healthier life choices, useful skills, and of course lots of fun! Meetings are TUESDAYS from 3:30PM to 5:30PM. For more information, please ask the BMS Main Office for Ms. Cuenco or Mr. Espina. Landen Torres and Everinta Bossy represent BMS at Chamoru Studies Santa Misa for the opening of Chamoru Month. BMS Honor Choir takes 3rd Place at the Tumon Bay Music Festival! Our very own BMS Honor Choir, under the direction of Ms. Joy Ada and the instruction of Ms. Monique Hernandez, takes home 3rd Place at the Tumon Bay Music Festival, Guam's largest music event. Great job, Roadrunners! We're very proud of you! The Guam Police Department and Guam Crime Stoppers hosted their first basketball workshop on March 2nd and 3rd. BMS students participated in the event where they learned not only positive behavior through sports but also learned about alcohol prevention, bullying prevention and fighting, carpentry skills, and more. Special thanks to Officer Tapao for inviting us! Thank you for the great parent turn out on Feb. 21st PTO and being a part of celebrating your child's achievement! A and B Honor Roll and athletes were recognized at the event. Also, thank you for your participation and input on school concerns. Kudos to BMS Math Counts! Kudos to our BMS Math Counts for representing our school during the Chapter Competition on Feb. 18 at the Pacific Star Hotel! Please come and join us in recognizing our A and B Honor students and 1st Semester Athletes in this coming Tuesday's PTO. If your child is in the A or B Honor Roll, you will receive an invitation on Monday, Feb. 20. Team 7B Celebrates the Joy of Learning at Their Second Annual "For the Love of Learning Carnival"
Team 7B Island Warriors hosted their annual learning carnival. Students paid $2.00 to an all access learning event that allowed them to put their knowledge to the test through games and activities. Students from Island Warriors created educational games such as, Math Royale, Around the World Balloon Race, and Bottle Flip Trivia. The event was fun-filled as the participants experienced the joy of learning! Lessons about peace continue even after the Peace March in Mr. Manibusan's art class. Check out these beautiful art work! Congratulations to BMS girls soccer for winning against Jose Rios Middle School with 4-1 on last Friday's game (Feb. 10)! Congratulations to BMS boys basketball A and B team with their win against Agueda Johnston Middle School! Way to go, Roadrunners! ​"Peace- It's Up to Us!" The annual Peace March is an event that means a lot to our BMS family. This is the time where we come together with our community to bring awareness and promote peace and nonviolence. Roadrunners march from Marie Ulloa Elementary School, to Wettengel Elementary School, and back to BMS to loudly proclaim our school's celebration of cultural diversity. We would also like to acknowledge and thank our special guests and community partners for being an integral part of today's celebration: Senator Telena Nelson, Dededo Mayor Melissa Savares, Major and PTO President Vince Guerrero, Officer Paul Tapao and the Guam Police Department, Island Girl Power Director Ms. Juanita Blaz, and Kids from Chuuk. Special thanks to Mr. Egrubay, Ms. Milan, Mr. Dela Cruz, Mr. Malilay, Ms. Rojas, Mr. Espina, Mr. Balajadia, Mr. Camacho, Mr. Batangan, Ms. James, Ms. R. Nelson, Ms. Pilarca, Ms. Pineda, Ms. Brochon, Carissa Lazaga, Sharlene Maza, Ms. Libranda, Ms. Togawa, Ms. Delia Castro, Ms. Theresa Castro and SBA, Ms. Julie Reyes and NJHS, Mr. Jordan and Cultural Dance Club, Ms. Quidachay and BMS Choir, Mr. Vergara, Ms. Abagatnan, Mr. Manibusan, Ms. Dee Fernandez, Ms. Shirley Cruz, Sodexo and to everyone in our faculty, staff, and students who have worked so hard together to make this event a success! Ahhh... Beep! Beep! Check out more of our story on the Guam PDN website. ​Guam's only mobile care clinic will resume free outreach services on Sunday, February 12th at the Dededo Senior Citizens Center from 10am-1pm. Immunization for adults and children will be available, including Flu and HPV shots for adults. Volunteer doctors and nurses will be on hand for physical exams and medical consultations. Public Health eligibility specialist will also be on site to process applications for public assistance programs. Marie Ulloa Elementary School 5th graders visited BMS on Feb. 8 for an orientation to middle school life here at BMS. Thank you SBA and NJHS for all your help to make the visit successful. Awesome job to all who participated in this year's door decorating contest! Each class did such a wonderful job that teachers had difficulty choosing this year's winner but a decision still had to be made. And we are happy to announce Ms. Pineda's AAP for 1st Place and Ms. Jenson's AAP for 2nd Place. Congratulations! Congratulations to our Boys Rugby Champions! The Guam Board of Education recognized them for their achievements at Wettengel Elementary School, and they are Evan Aganon, Christian Asistol-Tenorio, Nicholas Gumataotao, Matthew Ecijan, Jacobe Quinata, Angelo Olidan, Kehziah Santos, Ryan Mendiola, Jerimiah Camacho, Jacob Mercado, Dylan Manibusan, and Rizaldy Tugade. Meet our hardworking Math Counts participants who sacrificed their Saturdays to prepare for the upcoming Islandwide Chapter Competition. Kudos to all the Coaches: Ms. Ross, Ms. Palacios, and Ms. Nievera. Congratulations to our SCRIPPS Spelling Bee Champ, Adrian Tambora! SCRIPPS Spelling Bee was held last Friday, Feb. 3, 2017 in the library where students demonstrated their spelling prowess until a champion was named. Kudos to all who participated and to all grade-level finalists! Kudos again to the following awesome teachers for making this happen: Ms. Fejeran, Ms. Togawa, Mr. Balmeo, Ms. Cortez, and Ms. Acabado. Thank you for all your canned goods donations! Congratulations to Ms. Muritok's, Ms. Hernandez, and Mr. Natuel's AAP classes for raising the most canned goods in their respective grades. Canned goods will be donated to the Guam Homeless Coalition. Thank you again to all who donated for this worthy cause! Peace- It's Up to Us! BMS RoboRunners and DigiRunners take home the trophies for the First Lego League Pacific Championship! Congratulations to our very own RoboRunners for taking 2nd place and DigiRunner for taking 3rd place in the FLL Pacific Championship held at the Micronesia Mall last Saturday, Jan. 21, 2017! RoboRunners also won the Robot Performance Award. Great job to coaches Mr. Lazaga, Ms. Togawa, and Ms. Brochon! Thank you to everyone in our Roadrunner family for showing your support! Come out and show your support to your fellow Roadrunners with this year's First Lego League Pacific Championship! The school with the most supporters will win a prize to further help the Robotics program in the school. The Guam Homeless Coalition (GHC) is in desperate need of canned good for their annual homeless point-in-time count on Friday, January 27th, 2017. As a result, they reached out to the DOE SPCE Outreach program asking for DOE's assistance to collect canned goods. January 9th: Collection start date. January 17th: Have AAP student reps deliver all donated canned goods to the Outreach Office in the library for a final count. January 17th/18th: Outreach Office will announce the AAP Class that collected the most canned goods and give teacher the food/Media Waiver. Waivers must be signed and submitted for student to participate in the pizza party and photo opp. January 19th: Presentation of canned good donations to Guam Homeless Coalition (GHC) Representative(s): 8:30am – 8:45am. Picture Opportunity with GHC, Admin, AAP Teacher, and students that collected the most canned goods). Brief thank you presentation from GHC reps.
January 25th: Pizza Party during lunch break in the respective AAP Class. BMS had the honor of hosting Mr. Carlo Carino- local graphic novelist. Mr. Carino shared about his novel Finding Harmony with our Roadrunners. Kudos to Ms. Jenson's homebase students for valuing their community! Ms. Jenson's homebase class is walking the talk by donating two trash bins to the school cafeteria. Thank you for taking pride in our school and valuing our school community. Great job, Roadrunners! Thank you to all who donated to this year's canned food drive. SPCE and EIF were able to collect 175 cans for Sanctuary. Great job BMS boys and girls teams for winning against the teachers/staff in a friendly game of volleyball on December 23! Of course! You guys are the best out there. A heartfelt gratitude to Mr. Elmor Derosas for his 17 years of service in teaching music, encouraging talent, and inspiring young minds here at BMS. His BMS family also thanks him for sharing our students' musical gift to the island. We wish him the best in his endeavors and will miss him dearly. Roadrunners were spreading Christmas cheer from classroom to classroom as fellow students, staff, and faculty listened in awe of their beautiful voices. Wonderfully done, Roadrunners! All students interested in joining BOYS/GIRLS BASKETBALL, GIRLS SOCCER, BADMINTON or BASEBALL see Mr. Manibusan in room 46 during HB/AAP. Boys and girls sign up NOW!!! *Click here for more sports announcements. Roadrunner's very own Mr. Patrick Camacho with the SPCE program earned the National Champion title for cycling after Tour of Guam 2016 on December 11. ​Mr. Camacho took a few minutes to sit down with us to answer a few questions about his sport. "Since 2010. But I started to take it more seriously in 2013." What got you started back in 2010? "I got tired of running. So, I started training for triathlons and even learned how to swim. When I got tired of doing triathlons, I focused on cycling." How do you train for competitions? "I train six days a week. My routines consists of 3 high intensity days of 2 hour hill repeats at Nimitz Hill or time trials in Marine Drive, 2 days of endurance training, and finally, spins and easy recovery rides." Do you have advice for students who want to get in this sport? "Chase your dreams, which I literally am doing. When I got into cycling in 2010, I started with a 20 year old road bike that I bought for $150. I was determined to always progress and made it my goal to catch up to the cyclist ahead of me in every race. Even though I had 'junk equipment,' I would finish in the top ten of races, and then people started seeing my potential. Eventually, I was able to buy better equipment and have others investing in me. Another advice that I have is to find a sport that can be a positive outlet for you. Cycling has become that for me when I am stressed." The Student Parent Community Engagement Project (SPCE) and Esgaihon I Famagu'on-ta (EIF) are hosting this year's "Roadrunner Canned Food & Non-Perishable Items Holiday Drive." Collections will be from November 28th to December 20th. Collections will be done by the students in the EIF class during AAP only. Donations will be picked up by Sanctuary on December 21st. Student sign-in sheet will be with students' grade-level teams. Students who donate will be given ONE dress down pass (no matter the amount). Dress down days will be decided by the teams. Dress down passes will not be reissued if lost. Dress down passes will not be accepted if date on back is scratched off or with white out. Dress down guidelines (BP401 Uniform Policy) must be followed: No hats and bandanas; revealing clothes, blouses, high heels; clothing with obscene language or pictures; and open-toed shoes. On November 14, 17, and Dec. 1, U.S. Attorney Alicia Limtiaco gave a presentation to our 8th Graders on the importance of Internet safety and raise awareness against cyberbullying. Thank you, Ms. Limtiaco, for teaching Roadrunners how to be safe, responsible, and respectful online! Kudos to Mr. Derosas and BMS Choir for representing our school at Agana Shopping Center for "It's a Magical Christmas" and St. Paul's Christian School with their beautiful gift of music! Wonderful job, Roadrunners! Ms. Iris Gaza and students from Academy of Our Lady of Guam gave their presentation on Nov. 15 to broaden our 8th Graders' options for high school. For more information on AOLG, click on this link. From now till mid April, students can participate in this year's Roadrunner Reading Challenge sponsored by our library. Students are encouraged to read five books from the following categories to win a free book. So, come on Roadrunners! Let's get reading! *Please note: Participants are chosen by team teachers. The library will be closed on this day except for the participants with passes.. Thank you for your patience and cooperation. November 15 (Tuesday) meeting time is at 5:30PM. Get ready to show some spirit! Students not participating must be in full school uniform. Participants still need to follow dress down guidelines: No slippers, tank tops, short shorts, or gang related clothing. Students who participate in 3 or more of the themes during the Spirit Week will earn ONE dress down pass. Names will be collected by SBA from Homeroom teachers. From the students to the faculty and staff, you can tell that Roadrunners got the spirit! This year's Halloween was filled with spooks, creative characters, and fun activities. And despite the many zombies and the pencil through Ms. Ancheta's forehead, we guarantee that it was all good, safe fun. Students from Sanbongi Junior High, Japan, received a warm welcome from our BMS Roadrunners. Thanks to Glee Club, Cultural Dance Club, and Hip Hop Dance Club with showcasing BMS talent through music and dance. Students shared friendship and cultures until it was time to bid their farewells. Way to go Roadrunners on last night's home game against Inarajan Middle School! Boys A-Team took home the 3rd place title and B-Team took 2nd. You represented our school well. Aahh... Beep! Beep! Fill out for annual budget request for Fiscal Year 2018. Free Health Screening from the Mobile Care Clinic- Open to the Public! *Children below 18 years of age must be accompanied by a parent. If not the parent, must be an adult with legal documents or written authorization from parent. Parent, guardian, or authorized adult must bring photo I.D. Support anti-bullying cause and wear orange on Oct. 19 (Wednesday). Students can wear orange tops but must be in uniform bottoms. This year's theme is "Yolo (You Only Live Once)- Be Drug Free." SFC Corina Andre, SPC Trisha Jardeleza, PVT2 Cameron Lunod, and Ms. Amy Baleto from Counterdrug Program, Guam Army National Guard; Mr. Monty Mcdowell, Ms. Beth Fredrick, and Mr. Franquez Roland from the Guam Chamber of Commerce. Welcome to BMS, Sano High! Our students had the opportunity to make friends, showcase talents, and share cultures with students from Sano High School from Japan. Great job, Roadrunners, in making them feel the Hafa Adai spirit! Student Pick-Up Points for Car Riders: Please be advised that location for student pick-up is at the end of the walkway in front of the Main Office. Meet the hardworking ladies who make sure healthy meals get to our students: (from left to right) ​Emmy Uwayangmal, Erlinda Ticsay, Lilia Buensuceso (manager), Joseline Nicdao, and Joann David. Late-comers may park outside of the fence by the baseball field. Spectators not allowed on any part of the course; but may watch from the sidelines. The Guam Men's 16U team earned bronze in the 18U Micronesia Invitational Basketball Tournament held July in Palau. The roster boasts of two Roadrunners -- Matua Borja and Kevin Cabral. Both were instrumental in the teams quest for hardware. Both are currently freshmen at Okkodo High school. The Guam Women's 17U basketball team grabbed a championship in the PYD Buddy's International Competition held July in Lucban province, Philippines. The 17U team finished undefeated against several college teams from Lucban. The VSA Benavente Middle School Roadrunners were well represented with four former students and two BMS coaches on the roster. Danica Cacayan, Danica Cabrera, Shania Bulala and Raquel Camacho all played a vital role on the team's quest for a hardware to being home. As the top scorer among athletes, Bulala earned tournament MVP, while Cabrera grabbed Finals MVP with her performance in the gold-medal game. The Guam women were coached by Mike Cabral, who also coaches the girls B team at BMS, and Arleen Mad, who coaches the BMS Boys B team and teaches 8th grade reading. All four athletes come from a winning program, earning championships during their time at BMS with Coach Erwin Villa. Come out and participate in GDOE's 2K/5K Fun Run! THANK YOU to all who helped make BMS Clean Up Days a Success! New Student Orientation a Success! To view the Orientation slides in its entirety, click here or on the image to the right - "Life as a Roadrunner". Former Roadrunner Represents Guam in the Olympics! Best of luck to former Roadrunner, Regine Tugade, who will be representing Guam at the XXXI Olympic Games in Rio de Janeiro. She will be competing in the preliminary round on August 13th, 12:55am (ChST) in the 100 meter race. BMS Staff hard at work! Shout out to the awesome efforts of the BMS staff who've been working diligently in preparation of the new school year! Siñot Ray paid tribute to Dr. Camacho-Dungca, who spent her life cultivating the language and culture of Chamorros. The BMS school community offered a moment of silence in her memory. On March 1, BMS kicked off Mes Chamorro in a school wide opening ceremony headed by our Chamorro teachers - Siñorita Victoria Guiao (with the support of her family) and Siñot Ray Barcinas. Our Mayor Melissa Savares was in attendance and gave a few words to our school community. During the ceremony, BMS students from the Chamoru classes, Guahan Roadrunners, and the Glee Club performed numbers related to the Chamorro. Learn more about our uniform policy by clicking here. To learn more about our policies regarding student tardiness, click here. Click here (or on the photo on the right) to view BMS' Revised Behavior Matrix. All students are expected to know and practice positive behavior in all areas, as described in our Roadrunner Behavior Matrix. Students in Mrs. Lacno's Home Economics class competed in the school's first "Edible Book Contest!" Held on Dec. 16th, participants created renditions of their books with food items such as cakes, cookies, fruits, and more. Best Show and First Place Best Teen Fiction Award: Thelma Rogers & Tya Taitague for "The Fault in Our Stars"
2nd Place Teen Fiction Award: Tricia Calilung & Anjeline Magoto for "Minecraft Blockopedia"
1st Place Best Children's Fiction Award: Kelsey Sablan & James Enchon for "Alice in Wonderland"
2nd Place Best Children's Fiction Award: Charmaine Espinosa & Mika Delos Santos for "Rudolph the Red Nose Reindeer"
Best Show and People's Choice Award: Mrs. Brochon for "Snow White"
1st Place Best Teen Award: Mrs. Balmeo for "Sisterhood of the Traveling Pants"
2nd Place: Ms. Martina Nelson for "Pet Cemetery"
3rd Place: Mrs. Abagatnan for "Harry Potter"
People's Choice Award: Mrs. Mendiola for "Divergent"
Best Children's Fiction Award: Ms. Teresa Castro for "The Three Little Minions"
School Beautification: Thanks, Blue Dragons! Blue Dragons students participated in school beautification for their team's Team Building Activity. They worked together to ready the field for our soccer and rugby games. Way to go, Blue Dragons! Kudos to Advanced Art Student, Antonelli Salayon who took 2nd place in the Island-Wide International Peace Poster Contest. Int'l Games Day in the Library! GDOE Plumbers hard at work on our campus. Thank you for all you've done for our school community! BMS Library Celebrates Teen Read Week! During the week of Oct 26 thru Oct 30th, students in the National Junior Honor Society did several read-alouds to a group of student patrons from BMS. Both groups enjoyed the event! Thank you, NJHS members! Hafa Adai! Thank you for visiting our school website! Please take a moment and complete a survey (four items only!) by clicking on this link: http://goo.gl/forms/QkWTTayLI2 or on the "Guam Department of Education..." text above. THANK YOU! In celebration of Constitution Day, BMS students in Ms. Theresa Castro's Social Studies class were fortunate to listen to two presenters: Attorney Geraldine Cepeda and Mr. Andren Mayoyo, of the Judiciary's Justice Corps Program. Thank you for paying our students a visit! Music, our Mayor, and MMA Fighters! At BMS, we strive to perpetuate a school climate of pride and respect - of our selves and the other. To help better articulate this message, our Roadrunners sat in on special grade-level assemblies where they got to accompany the musical talent of one of our own teachers, Mrs. Joy Ada and her friends - John Leon Guerrero on guitar, and Rob San Agustin on the drums. We are fortunate to have one of the island's best, Mayor Melissa Savares, who gave her time at each assembly, and also offered a few words about the importance of our community coming together, despite our differences. Several fighters out of, or affiliated with, Spike 22, Countershot Kickboxing Academy, and Ground Fu came out and spoke about the discipline of their sport; about the courage it takes to keep fights within the ring. They shared how their love of fighting was something that they were able to transform from that of negativity to positivity, as they grew to understand themselves, their values, and the value of "real" friendship. Many, many thanks to Ricky Camp, Ryan Babauta, Robert Wusstig, and "Baby Joe" Taimanglo! To capture the moment, iFit Guam's Rajiv Daryanani was hard at work documenting the fighters' interactions with our students. Even more, students who answered questions were given FREE iFit Guam tanks courtesy of owner, Shivrani Daryanani! Our Roadrunners definitely had an assembly to remember, with a powerful message that we hope resonates: that there is always a choice to be made. These are the biggest "fights" of all - the ones we have within ourselves. And we can win. We can choose to do the right thing, always. Thank you to all those who came out in support of our Roadrunners! We are most grateful! Ahhh, Beep, Beep! Community Involvement at its Finest! Over the three-day weekend, the Chuukese Catholic Faith Youth for Christ (CCFYC) gave their time and service to beautify our campus. Some youth are even former Roadrunners! BMS is most appreciative of all their hard work! Ahhh, beep, beep! Lead by Mr. Orichy Orichiro and Mr. Blacky Komis, men and women from our Chuukese Community (some from the Chuukese League and/or the Chuukese Mininstry) gave their time and service to spruce up the school gym. THANK YOU!!! It was standing room only at today's New Student Orientation! Such an awesome turnout from our incoming Roadrunners! SY 2015-2016 is just days away! Miss the Orientation? OR want more information on what to expect for the school year? Click on the photo below "Life as a Roadrunner" to view today's presentation. Prepping for the new school year! Winners of the Silver Consolation Bracket in the Sugar and Spice (Private vs. Public Schools) Tournament on March 7. On February 6, BMS students took the streets again, demonstrating that we are a school that looks to establish a peaceful environment on our campus, in our community, and in our lives. The entire school community walked to neighbouring elementary schools - Maria Ulloa and Wettengel Elementary, where the entire school also came out to extend this message of Peace. Elementary school students gave high-fives, cheered, and supported our Roadrunners as they passed through the campus. It was amazing! Upon returning, there were several performances that were much enjoyed. Kudos to Team Y2K15, BMS Honor Choir, Guahan Roadrunners, Glee Club, and some brave student singers, too! The community was also much involved in the day's event. Dededo Mayor Melissa Savares was out in full gear, supporting the children, but also took to helping with traffic control in the streets! Her staff was out assisting, as well. Several officers from the Guam Police Department were present and helping to guide our students and to assist with traffic control alongside the mayoral staff. Parents from the school's PTO were present, too! We were full circle at BMS' Peace March! Ahh, Beep! Beep! BMS teachers were immersed in an awesome four-day training on Standardized Assessment and Grading with internationally renowned Dr. Robert Marzano and his team - Dr. Jeff Flygare and Dr. R. Marc Brodersen. It was a busy Halloween at BMS! Faculty, staff, and students came out with such spirit! Some students went trick-or-treatin' throughout the school. The Student Body Association officers and representatives were also hard at work putting together a Haunted House. Roadrunners competed in the All-Island Cross-Country Meet at Astumbo Middle School on Oct. 30th. Congratulations to Larry Rosario and Amirah Vegafria for placing 4th in their respective division. Maria Sophia Minas and Melvin Reyes were 1st place winners in the B Team race. Neil Pineda, Interscholastic Program Coordinator, presented their awards. Way to go, Roadrunners! Aahhh...Beep! Beep! Our Differences Make Us Boo-tiful! Students from Ms. Julie Ancheta's class display a Halloween Bulletin Board with a wonderful Halloween message: Our Differences Make us Boo-tiful! The Benavente Middle School Science department/ Eco Explorers Club hosted a (second!) sidewalk cleanup from 8-11 a.m. on "Make a Difference Day" (October 25th) on Santa Monica Street. Students, parents, faculty, and members from the community, including support from the Dededo Mayor's Office, gathered with various gardening equipment to clear a pathway to promote a safe biking route in Dededo. The cleanup is part of an extension of a bike route in Dededo to advocate cycling and safe walking on Guam! Team BCS competed in the 9th Annual Guam Ko'Ko' Ekiden Relay Road Race on October 19, 2014. They placed 89th overall out of 234 teams and 11th out of 17 in the school division. Their finish time was 2:01:05. October 16 Great Shake Out! TEAM THUNDERBIRDS participate in Guam's Great Shake Out. Photos are taken from the following team teacher's classes: Ms. Gimenez, Mrs. Muritok, and Mrs. Lubas. Eco Explorers Science Club Gives Back! The Eco Explorers Science Club hosted a sidewalk cleanup from 8 a.m. until noon on Sept. 27. All science teachers were present at the event, with support from some staff. This cleanup was part of a project that aims to add a bike route in Dededo. Help make safe cycling and walking a reality on Guam! Bring a Book, Get a Book! Check it out! Several students have already started submitting their book donations. Our BOOK SWAP will happen in the month of October (or early November)...so get your coupons now! HOW? Check out the flyer (included in the slideshow below, see flyers around campus, ask a teacher, or stop by Room 32 for more info). BMS loves to read! 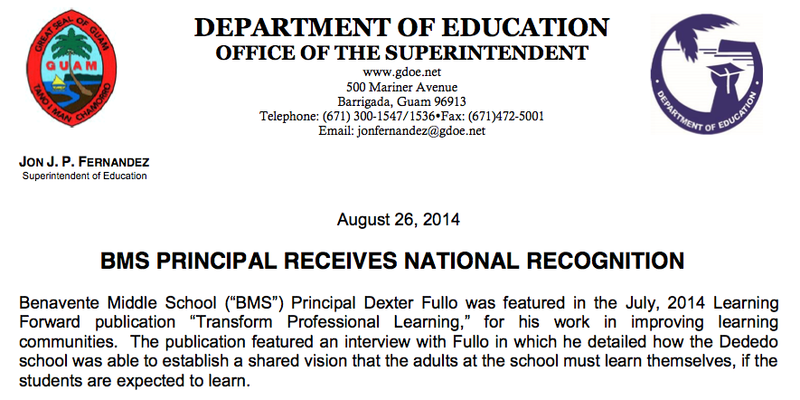 Kudos to Our Principal, Mr. Fullo! Click here to visit Learning Forward's site which features Mr. Fullo in their July publication of "Transform Professional Learning" for his work in improving learning communities. Click here to see the news release announcing the recognition of our Principal Dexter Fullo by Learning Forward, a national organization focused on advancing professional learning to impact student success. Click here to view a Marianas Variety article on the Guam Education Board's recognition of Mr. Fullo on his work and achievement. Click on the image to download file.